This distress call is not from a sinking ship but from the supreme body that represents the Judicial Service Commission (JSC) of Sri Lanka, which is desperately stating that the independence of the judiciary is under threat from the executive. The Asian Human Rights Commission has for years warned that democracy in Sri Lanka is sinking and this distress call from the JSC is one of the final indications of how fast it is sinking. If Sri Lanka has any friends left in the democratic world, it is time now for them to respond. The JSC, through its secretary Manjula Tilakaratne, complained on September 18, 2012 about threats to its independent functioning. This is the first time in the history of Sri Lanka that the JSC, which is the highest body dealing with appointments, dismissals, disciplinary actions and promotion of judges in the country, has made a public complaint about attacks on its independence. A translation of the full statement is given below. 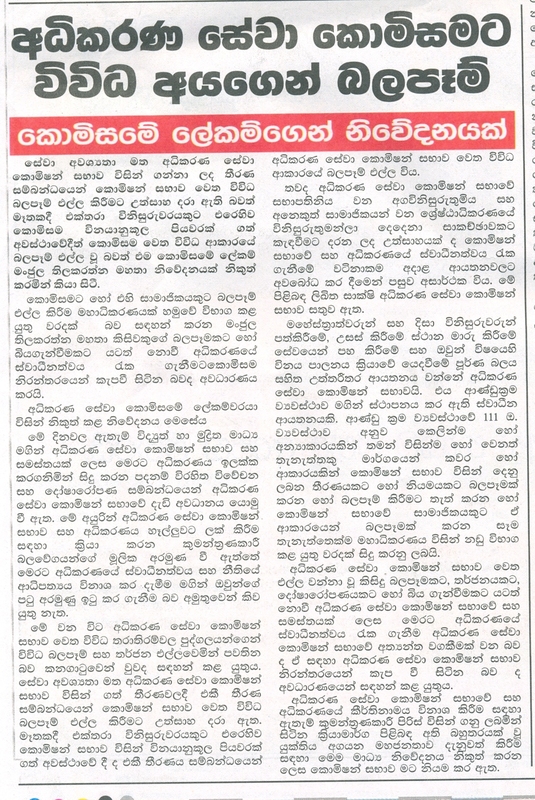 (A copy of the Sinhala original published in Lankadeepa, a well known Sinhala newspaper is also attached). “The attention of the Judicial Service Commission (JSC) has been drawn to baseless criticism of the JSC and in general on the judiciary by the electronic and print media. The main objective of those behind the conspiracy of those trying to undermine the JSC and Judiciary is to destroy the independence of the judiciary and the rule of law. “It is regrettable to note that the JSC has been subjected to threats and intimidation from persons holding different status. Various influences have been made on the JSC regarding decisions taken by the Commission keeping with the service requirements. Recently the JSC was subjected to various influences after the Commission initiated disciplinary action against a judge. “Moreover an attempt to convince the relevant institutions regarding the protection of the independence of the judiciary and the JSC over the attempt to call for a meeting with the chairperson of the JSC, who is the Hon Chief Justice and two other Supreme Court judges, was not successful. The JSC has documentary evidence on this matter. “It is the JSC that is the superior institution which is empowered with the appointment of Magistrates, District judges, their transfers, dismissal from service and disciplinary action against them. It is an independent institution established under the Constitution. Under the Constitution any direct or indirect attempt by any person or through any person to influence or attempt to influence any decision taken by the Commission is an offence which could be tried in a High Court. This translation was reproduced in the Political Column of the Sunday Times on September 23, 2012. A call for the three-member commission (JSC) consisting of the Chief Justice and two other judges of the Supreme Court to meet the Honourable President of Sri Lanka to discuss the functions of the JSC. The JSC declined to attend the meeting as they found it unconstitutional to discuss the decisions of the JSC with anyone else. Attempts to pressurize through the interventions of several powerful persons to remove the interdiction of a particular judge, who was interdicted by the JSC as a part of inquiries into very serious allegations of corruption. According to newspaper reports, this judge is said to be a close friend of the president’s family. A media campaign through state media channels against the judges of the Supreme Court and members of the JSC on baseless allegations and the unethical use of language for the purpose of belittling the judges and to undermine the independence of the judiciary. Many will already be aware that there was a previous incident of a cabinet minister, Rishad Bathiudeen, attempting to intimidate the magistrate of Mannar, followed by two attacks on the High Court and the Magistrate’s Court of Mannar, which caused serious damage to both premises. That minister is now facing charges of contempt of court at the Court of Appeal and he and some others are also facing criminal charges before the Magistrate’s Court. The attempt to intimidate the magistrate and the attacks on the courts led to a nation-wide boycott on the courts by the judges and lawyers of Sri Lanka. Despite of the public outcry, the government has taken no action against this minister for his behaviour in relation to the interference with the independence of the judiciary. A further event of importance is that, following an order by the Supreme Court in reviewing a bill placed before it, the court held that the particular bill was unconstitutional until consultations are held by the Central Government with the provincial councils about the matters taken up in the bill. The court made its ruling known to the Speaker, who read the court’s ruling to the parliament as is required by the Constitution. However, following this ruling, three members of the cabinet and a crowd, reported in the newspapers to consist of about 3,000 persons, held a protest against the Supreme Court in front of the parliament. All these recent events are a part of a chain of events that have been taking place since 1978, with the promulgation of a new constitution that placed the executive president outside the jurisdiction of the courts. The new constitutional order proposed by the 1978 Constitution is unique and has no parallel anywhere else in the world. It established the executive president with absolute power and ever since there has been a constant conflict between the judiciary established under the earlier constitution of 1948, which recognised the separation of powers and which incorporated the independence of the judiciary as an integral part of the constitutional order, and the executive presidential system. Several attempts to get over this problem, such as the 17th Amendment to the Constitution, were abandoned and the president’s power was even more strengthened by the 18th Amendment passed in 2010. This conflict has now reached a proportion that the Supreme Court through the JSC has had to make a public complaint of interference into the independence of the judiciary. Over several decades, the Asian Human Rights Commission has pointed out that the independence of the judiciary in Sri Lanka is facing peril due to the operation of the 1978 Constitution. The AHRC has consistently commented on the conflict created by the executive presidential system, which replaced the democracy in Sri Lanka with a system of patronage. The executive presidential system has wrapped itself around all democratic institutions, including the judiciary, like a python and has broken bones. Saving the independence of the judiciary now is almost an impossible task. Unless the people of Sri Lanka themselves and their friends in the democracies throughout the world rise up now, very soon the functions of Sri Lanka’s judicial institutions will be reduced to nothing more than rubber stamping. Such things have happened in several other countries, for example, Cambodia and Myanmar. Attacks On Judiciary: Painful Blows On ‘Rule Of Law’, Can It Survive?